Peel and segment 1 pink grapefruit and 2 oranges with a sharp knife. Juice another orange. Grate 2 teaspoons ginger and whisk together in a small bowl with 1 tablespoon honey and the orange juice. 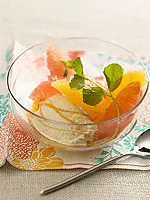 Place citrus segments in a serving bowl and drizzle with the honey mixture. Refrigerate 1 hour, and serve as is or over low-fat vanilla ice cream for a light dessert. Garnish with fresh mint, if desired.